In the high heat of the spring at the Access Theater's Black Box comes something that sounds really cool. It's Flux Theatre Ensemble's production of Jason Tseng's Rizing. It's a zombie sci-fi drama about finding a cure and making a sacrifice. But what happens when that cool idea melts away in execution? You get a two and a half hour overstuffed attempt at something meaningful. Written by Jason Tseng comes the latest addition to the sci-fi theater trend. Rizing follows the Z+ inhabitants of a post apocalyptic metropolis where the infected and negs are virtually segregated. This place is home to Mica, a zombie, and her neg doctor lover Brynne Quillis. It's home to a zombie anonymous meeting director Tulle and his lover Alto. And home to a group of zealots hard pressed on making a statement. Rizing is a statement piece. And it's evident in the program note. Playwright Jason Tseng states that the blaring parallels to the AIDS crisis are the backbone of the piece thusly making Rizing what it is. Blend The Normal Heart, "Dallas Buyers Club", Nazi Germany, terrorism commentary and Zombies and you get Rizing. If it sounds like a lot it's because it is. Tseng's idea is clever. Using zombies as a metaphor for the AIDS crisis is fascinating. But it would have been more fun to discover the parallels on our own. Regardless, the text is not as strong as you'd hope it to be. With some questionably poor dialogue that you could see the company fight to get out of their mouth, Tseng's text tries to do too much at once. Like The Normal Heart, it appears that we'll watch one prime player with a cast of supporting characters. Only this isn't quite the case. Mica's story is often brushed aside for the subplots, many of which are hefty in time. While they do include crucial information, parlaying it in a different manner could have been of great benefit. Once Hex and his zealot army are introduced, the plot seems to take a drastically different approach, one that strays from the original intent. There is a way to marry the two but as it stands now, neither receives a clean resolution. Act II is rushed. Continuing with the Hex plotline, it’s clear that the intent was to shift from the “AIDS allegory” to something more in the lines of terrorism. With the Z positive people already paralleled to the gay community, it unintentionally turns the what would be gay radicals into villains, which is an unfortunate commentary. Rizing is an absolute beast of a play to realize on stage. Director Emily Hartford had her work cut out for her. Between the allegory that Tseng has infused into his story and the sci-fi elements, balancing the clarity of the two was integral. When Hartford found the realistic components of the story, she was in her prime. But when it came to the sci-fi, she seemed to falter. The storytelling got muddled and the intelligibility went down the drain. Hartford’s transitions could have been cleaner by simplifying the amount of scenic elements. There were just too many and it hurt the momentum of the story. Building a world that is clearly better suited for the screen, scenic designer Will Lowry had to work his magic. The futuristic set resembled marbled and it was appealing to the eye. The grey stage floor was a lovely touch but for those who noticed the hand prints on the edge breaking up the grey and black were rewarded. Avoiding the stereotypical warm colors of a post-apocalyptic world was a brilliant decision. Even the stark cool colors from lighting designer Kia Rogers was smart. Rogers offered some dazzling lighting looks. Even the sound scape from Janie Bullard added the perfect ambiance that Rizing needed. The costumes from DW kept in tune with the cool color scheme. They were a nice blend of futuristic using modern pieces. The only disappointment was the sad looking Z arm bands. Stephanie Willing served as fight choreographer. The execution seemed to be her greatest downfall. Between the staging and the disregard for costume, many of the fight elements looked cheap. And many of the naps were hurt by certain fabrics. 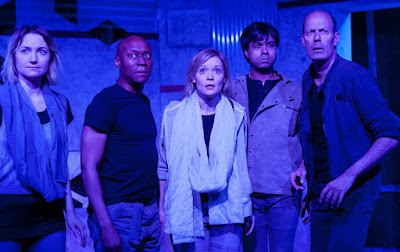 The ensemble was largely made up of sci-fi theater veterans, many of whom were a part of the recent Honeycomb Trilogy from Gideon Productions. Having experience in the genre certainly helped move Rizing to the top. As a whole, the ensemble was filled with performers who could find the equilibrium between sci-fi and reality. Leading the cast was the exceptional Alisha Spielmann. The believability that came out of Spielmann was unmatched. There are moments in the script where characters have to revert back to their zombie state. This had potential to be hokey yet Spielmann sold it. The other strong showing came from Jessica Angleskhan as Dr. Kestrel Khan. Angleskhan has great depth. It’s a shame that her character isn’t really a presence until Act II. Debargo Sanyal as Tulle brought the comic relief, though unwarranted at some moments. Gavin-Keith Umeh as Hex was perfectly terrifying. His character was more of a device but his authority was exactly what was needed. Arthur Aulisi seemed the let the genre get the best of him. As General Venture Quillis, the authenticity was not quite there. Rizing was an ambitious undertaking. Flux Theatre Ensemble has a piece that has great potential, it just needed a little more guidance and reworking. Jason Tseng has offered a truly remarkable commentary that is a step away from greatness.